Shanghai, Nov 9 : Olympic bronze medallist Saina Nehwal will aim to make a return to the women's singles top five in world rankings at the China Open Super Series Premier which will be held here from Nov 12-17. World No. 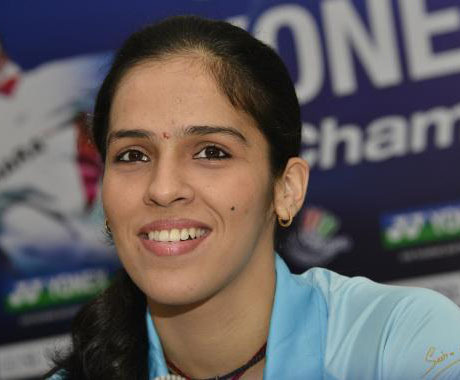 7 Saina, who will open her campaign against a qualifier, has been troubled by injuries this year. She had to withdraw from last years’ China Open due to a knee injury and will be hoping to make a mark this year at the $350,000 fifth and final Super Series Premier of the year. The Hyderabadi will have her task cut out as she will probably face defending champion and top seed Li Xuerei of China if she manages to reach the quarterfinals. Saina will have to be in top form in order to stage an upset. If the Indian manages to get past the hurdle, she will probably have to play either fourth seed Ji Hyun Sung of South Korea or German fifth seed Juliane Schenk in semis. Unseeded Arundhati Pantawane, the other Indian in women’s singles, will face another unseeded opponent in Eriko Hirose of Japan. The Nagpur shuttler is in good form and has reached a career best ranking of 47 after good performances at the Denmark and French Open. In men’s singles, unseeded Parupalli Kashyap will face eighth seed Boonsak Ponsana of Thailand in his campaign opener. Although Ponsana is a formidable opponent, Kashyap will take heart from the fact that he has performed well against the Thai in the past. World No. 12 Kashyap had reached the quarterfinals last year here and will aim for another good performance. If Kashyap manages to reach the quarters, then could face top seed and World No. 1 Lee Chong Wei of Malaysia. Mumbai's Ajay Jayaram will be up against one of the qualifiers in his first match. The World No. 26, who crashed out of the opening round last year, will most probably face Chinese World No. 2 in the second round.